You know I’m a big fan of Don McAllister’s ScreenCasts Online. I think it’s the best way to learn how to use applications on the Mac and iOS. It’s a subscription service at $6/month if you buy the yearly subscription. Think about that price compared to other online training courses. I’m biased because Don lets me create screencasts for him every couple of months but I’ve been an avid viewer of his subscription podcast for ages. I’ve learned so much from him even about products I’ve used for years. Anyway, I’m bringing all of this up again because I’m delighted to tell you that ScreenCasts Online now has an official AppleTV app and it’s really really cool! 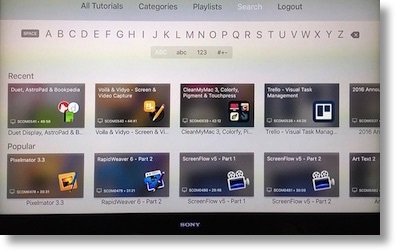 Don has built a great interface and you get access to the entire ScreenCasts Online back catalog on your big screen TV. Not only can you view simply the latest videos, you can also view by categories. 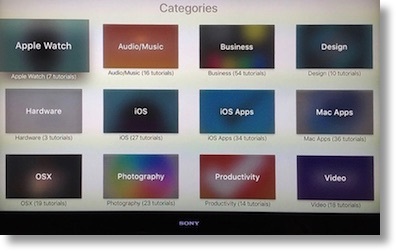 Categories include Apple Watch, Business, Design, Productivity, and my favorite, Photography. For some reason Don’s got tutorials on Audio and Music too. There are hundreds of videos in his catalog. 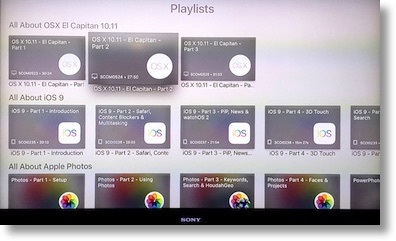 You can also view by playlists, like his entire series explaining iOS 9, or All about Apple Photos, and a series on El Capitan and a lot more. I’ve included a few photos of the interface so you can see how pretty it is. Another thing you might want to take into consideration is that Don goes to great expense to have subtitles included in his screencasts, so if you’re hearing impaired, or even if you want to watch while your partner is sleeping, he’s got you covered. Now it’s time to plug myself here. The latest video screencast on ScreenCasts Online is one of mine! It’s the one I talked about a couple of weeks ago where Steve helped me do a three camera shoot using a screencast, a camcorder, and an iPhone 6s for 4K video. I demonstrated three cool tools: Duet Display to let you use an iOS device as a secondary monitor for your Mac or Windows PC. 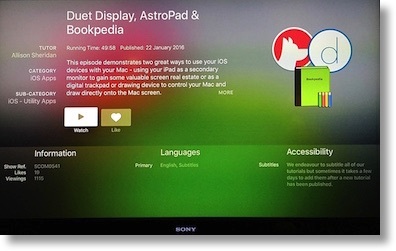 Then I showed Astropad, which lets your iOS devices access your Mac apps by mirroring the screen. It works on all iOS devices but it rocks to use an iPad Pro with the Apple Pencil for find detail work. Finally I wound up with one of my favorite apps, Bookpedia from Bruji, that lets you create a database of all your books. I love it .. I had a little trouble recently with my membership but Don and Mark hooked me up . Don’s team gives excellent customer service .